Spoilers for The Flash below. Tonight, The Flash was as back to normal as its episode title implied, even without the titular character actually able to live up to his own name. We got an interesting villain that added an interesting twist to Harry’s story, we got some fun Earth-2 stuff from dual Danielle Panabakers that sadly ended in Killer Frost’s demise, and the West family shared some interesting feelings about Barry/The Flash. But it was that ending that really blew the top off, as Harry revealed his worst or greatest idea yet: to create another particle accelerator explosion in an effort to get Barry his speed back. And while many viewers probably jumped to the conclusion that this follow-up blast will create a follow-up hero speedster, given there are some candidates for the job, the show’s creative team has all but crushed that theory. Both Wally West and Jesse Wells turn into quick-footed good guys in the comics, so there could be no better omen for their potential arrivals than the very incident that turned Barry into The Flash. That may be true-ish, but executive producer and co-creator Andrew Kreisberg recently came out and said that other speedsters wouldn’t be joining the show anytime soon, and said part of the fun was in having audiences guess about if or when those transitions would happen. And he said it during a screening of “Back to Normal,” so it seemed to be directly related to the possibility of Jesse or Wally getting powered up in the near future, rather than just an offhanded remark. According to Variety, Todd Helbing spoke about the futures of both Wally and Jesse. The comics’ Kid Flash sounds far less likely to show up in the coming episodes, as Helbing says there are still weeks to go before Wally stops following Iris’ Season 1 track and gets brought into the loop that Barry is The Flash. I can’t imagine that this dude would gain super-speed soon and neither tell Iris or Joe nor contact Barry again to show off his talents, then leading to everything coming out about everyone. And Helbing says that Wally isn’t going to be as much of a Team Flash player as Jesse soon will, which does make it sound like she might share some fast-paced skills with the Scarlet Speedster. But the way Hellbing explains it, her input here will be filling in as the group’s resident scientist with Caitlin currently out of the Earth-1 picture as Zoom’s hostage. Not that she couldn’t be both really smart and really fast. Of course, it’s possible that the lightning stuff we saw in the promo for next week’s episode is merely a dry run for the “real” explosion reproduction not set to happen for another few episodes, making it outside of Kreisberg and Helbing’s specific window of time in which we won’t seeing more speedsters. There would presumably be a hospital stay following either Wally or Jesse getting hit by lightning (or whatever possible new ways metahumans get created in this instance), and ain’t nobody got time for that when there’s a Zoom to catch. Well, Wally isn’t really doing anything to stop Zoom, so maybe he’d be up for some recuperation and relaxation. We all know The Flash can sometimes be pretty on-the-nose with its dialogue – just look at Joe’s amusing bad choice of words in the opening scenes – and we got to hear Harry call his daughter Jesse Quick in close proximity to him saying he wants to make a repeat explosion. And Wally reached out for a personal connection to The Flash, strengthening their bond. So those parts alone would almost be enough to assume that bigger things are coming for both of those characters, and the introduction of a second particle explosion just seemed to support that. But unless we’re being toyed with by Kreisberg & Co., that isn’t likely to happen. Unless it does. But even so, Kreisberg is making it clear that this will not become a super-team show, and that The Flash won’t deviate from keeping its central character atop the narrative food chain. What do you guys think? Are we indeed destined for Wally West and/or Jesse Quick zipping around Central City in the next few episodes, or is everyone behind The Flash on the up-and-up with their comments about more speedsters? Barry should probably get his own speed back before the show messes with any other good guys sharing that trait, so let’s hope the particle accelerator explosions works on him at the very least. 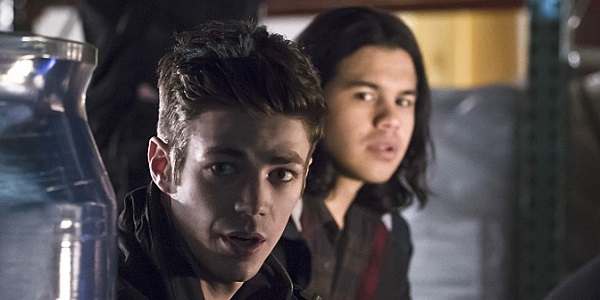 The Flash airs Tuesday nights at 8 p.m. ET on The CW.